Nature is full of surprises. Last week, researchers working in the Philippines confirmed that a giant tree-dwelling monitor lizard is a newly discovered species, Varanus bitatawa—a cousin of the Komodo dragon. Quietly going about its business in the treetops, it has until now evaded the gaze of science. 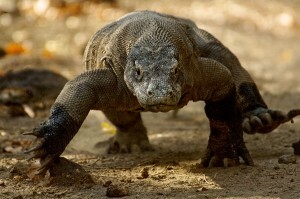 If you’ve been reading Life or watching the show on the Discovery Channel, you know that the Komodo dragon is a meat-eater, feeding on carrion and subduing living prey with venomous bites. But the elusive 6.5-foot Varanus bitatawa, which lives in the isolated forests of the Sierra Madre mountain range, eats mostly fruit. In an interview with the Associated Press, Eric Pianka, co-author of Lizards: Windows to the Evolution of Diversity, called the lizard “a spectacular discovery”. Meanwhile, scientists working in South Africa announced that a new hominid species, Australopithecus sediba, had been unearthed in a cave along with the bones of sabertoothed cats, mongooses, hyenas, and other animals. In Science Magazine, the authors reported that Au. sediba walked the earth almost 2 million years ago, and shares certain characteristics with the genus Homo. While scientists debate whether Au. sediba is a human ancestor or a separate branch that died out, its discovery adds a new piece to the puzzle of human evolution, as the discovery of Ardipithecus ramidus (“Ardi”) did last year. The bones of Ardi, a female who lived 4.4 million years ago, were discovered in Ethiopia’s Middle Awash region by a 47-member team that included UC Press authors Giday WoldeGabriel and Yohannes Haile-Selassie, co-editors of Ardipithecus kadabba, Berhane Asfaw, co-editor of Homo Erectus, and Tim White, editor of the UC Press Middle Awash series. Her skeleton is the most complete fossil evidence of a hominid earlier than the Australopithecus “Lucy”, and helps fill in a gaping hole in human lineage. Scientists have long thought of human evolution as a chain, and sought a “missing link” between apes and humans. But Ardi’s discovery changes the story, indicating that humans and apes may have evolved on entirely separate trajectories, from a shared ancestor that was neither human nor ape. The Middle Awash team published its findings in the October 2 issue of Science Magazine. In the video below, also from Science Magazine, Yohannes Haile-Selassie, Giday WoldeGabriel, Tim White, and Owen Lovejoy discuss Ardi and her implications for paleoanthropology. The Middle Awash region of Ethiopia, and the South African site where Au. sediba was found, will likely yield more secrets to hominid evolution, and the newly classified monitor lizard may be only the first of many unique species to emerge from the Sierra Madre forests. One living, one long extinct, these species are two of the latest chapters in the ever-unfolding story of life on earth.